This article explains how to restrict or remove unnecessary handler mappings for Microsoft SharePoint Foundation web application in the Integrated Request Pipeline of Internet Information Services (IIS) . Pipeline Changes at the ASP.NET Framework Level: Sharepoint does not change any thing for this level that mean sharepoint makes no changes to the machine.config file or the global web.config file. Pipeline Changes at the IIS Configuration Level : The modifications on applicationhost.config file.This file is located in the %WinDir%\System32\inetsrv\config\ directory and it contains registrations of the IIS Web sites and application pools on the server, as well as some settings that apply to all Web applications on the Web server. The settings in applicationhost.config are primarily oriented to the parts of the pipeline that are contributed by IIS, whereas the machine.config and the global web.config files contain settings that are primarily oriented to the parts of the integrated request pipeline that are contributed by ASP.NET. Pipeline Changes at the SharePoint Web Application Level: The modifications on web.config files. Pipeline Changes at the Directory Level : The modifications on directory levels still using web.config files.Particular physical or virtual directories in an IIS Web site can also have their own web.config file to add new settings or override inherited settings. The new settings and overrides, of course, apply only to HTTP requests for resources located within the directory and its subdirectories. Bellowed configuration is for standart sharepoint web application so if you have some custom codes that need extra handler please add needed handlers to list. 1) open your IIS console. 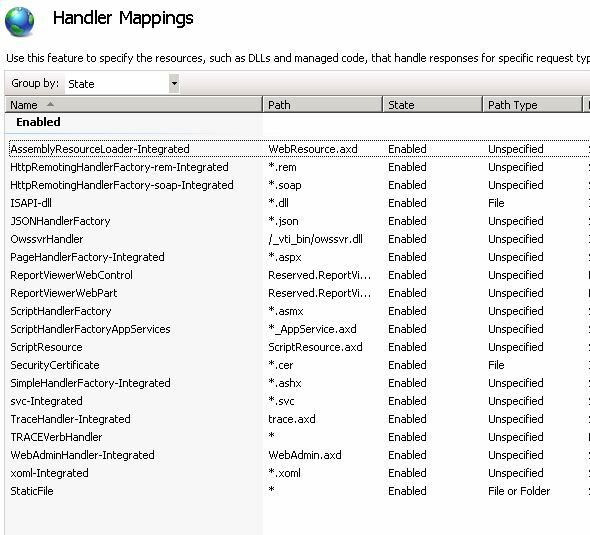 And Remove unneceserry handler mappings by selecting and clicking remove button on iis console. The handlers in picture below are the needed ones so don’t delete them. 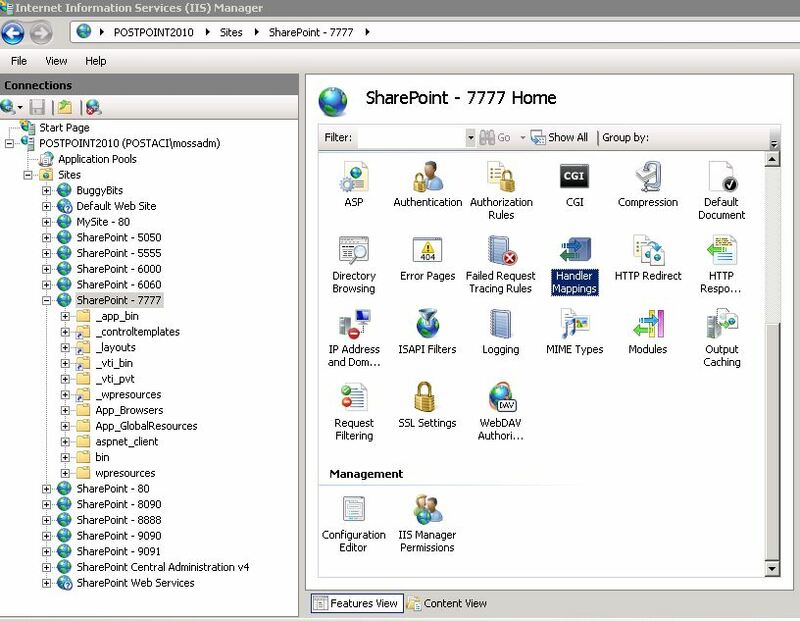 So sharepoint is not use any .net framework 4.0 components and the other iis default isapi extentions. Add your custom test items.